The downgrade reflects SAIL’s credit metrics being lower than Ind-Ra’s expectation for 9MFY16. India Ratings and Research (Ind-Ra) has downgraded Steel Authority of India Limited’s (SAIL) Long-Term Issuer Rating to ‘IND AA’ from ‘IND AAA’. The Outlook is Negative. A full list of rating actions is at the end of the commentary. The downgrade reflects SAIL’s credit metrics being lower than Ind-Ra’s expectation for 9MFY16. The steep fall in steel prices since January 2015 led to EBITDA losses for the company in 9MFY16 and the consequent worsening of its credit metrics. Improvement in Realisations to Remain Moderate: SAIL’s net sales realisation (NSR) declined 16.7% yoy to INR33,252/t in 9MFY16 driven by a 29% yoy increase in imports, excess domestic capacity, and moderate consumption growth of 4.7% yoy. Ind-Ra however expects the net realisation to increase by INR3,000/t-INR4,000/t post the introduction of minimum import price (MIP) for steel in India effective from February 2016. Lower-than-expected EBITDA/t: SAIL’s EBITDA/t eroded significantly during 9MFY16 to negative INR3,031 from INR4,300 in 9MFY15 driven by the steep fall in NSR, a 2.6% yoy marginal decline in sales volume, and high fixed costs specially employee expenses. However, Ind-Ra expects EBITDA/t to improve in FY17 with an improvement in NSR, a volume ramp-up, better absorption of fixed costs and higher contribution margins. Leverage Increases Significantly:SAIL’s gross debt increased substantially to INR299bn in FY15 (FY14: INR253bn), and is likely to have reached INR330bn by FYE16 due to the capex undertaken and cash losses incurred. Even after the expected improvement in EBITDA in FY17, the leverage is likely to remain above 5.5x (FY15: 5.93x, FY14: 5.72x), higher than the category medians. The agency believes increase in NSR is necessary for an improvement in SAIL’s overall credit metrics. Sales Volume to Increase: Ind-Ra expects SAIL to achieve volume growth of 10%-15% in FY17. Ind-Ra believes that post the implementation of MIP, the import of steel in the country would decline, but most of the other players who have also expanded their capacities would also look at producing incremental volumes. This could lead to higher competition which would manifest itself in aggressive pricing to gain volumes. According to the data released by Joint Plant Committee, Indian steel demand grew 4.3% yoy in FY16. However, domestic producers have not benefited, as the incremental demand was largely met through imports which increased by 20.2% while domestic production declined by 1.1%. Ind-Ra expects steel consumption demand to grow by 6.3%-6.5% in FY17. Raw Material Trends Mixed, Benefits Muted: According to industry data, the average cost of coking coal fell to USD84 in 9MFY16 from USD113 in 9MFY15 and SAIL has benefited from the fall in terms of lower raw material costs. However, the fall in iron ore prices has not benefited SAIL as it has 100% captive iron ore linkages. SAIL’s iron ore cost/t has in fact increased because it is required to contribute INR3.6bn annually towards District Mineral Foundation. Additionally, the increase in clean cess to INR400/t from INR200/t, applicable on coking and thermal coal will also increase raw material cost. Status of Capex: SAIL is undertaking capex of INR618.7bn for upgradation (INR227.4bn) and expansion (INR391.3bn) of its facilities. An additional INR102.6bn has been earmarked for augmenting raw material availability. At end-December 2015, INR690.8bn of capex had been undertaken which included regular maintenance capex. The benefits of the capex are likely to be visible from FY17. Till the benefits of increased capex begin to reflect by way of significantly higher volumes and improved efficiency, the leverage is likely to remain high. MIP Could Come as a Temporary Relief: The recent imposition of MIP on 173 steel products could alleviate the distress faced by steelmakers in the short term as the coverage has been wide and the duty has been defined in absolute terms. Around 80% of SAIL’s products are covered under MIP and the company has effected price hikes of 10% post the imposition and a further hike of 5%-10% is likely in FY17. However, this will not be enough for a turnaround as steel prices corrected by 35%-40% in 2015. Also, implementing sustained hikes in steel prices would remain challenging because of the commissioning of additional capacity of close to 12MT in 2016 and the MIP being currently valid till August 2016. 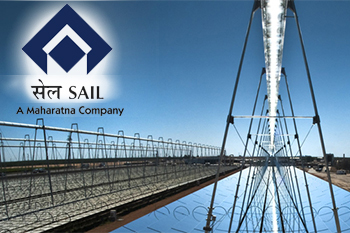 Strong Financial Support: The government of India owns 75% of SAIL and SAIL is a strategically important entity. The Maharatna status of the company provides it considerable financial and operational autonomy. In line with its ‘Parent Subsidiary Linkage’ methodology, Ind-Ra has factored into the ratings the potential support of the Indian government to SAIL, if required. Positive: Higher-than-expected improvement in the sales volume and EBITDA/t leading to an improvement in the credit metrics could result in the Outlook being revised to Stable. Negative: Lower-than-expected sales volume and/or EBITDA/t leading to further worsening of the credit metrics could result in a negative ration action.